Many people liked last week where I pulled a character that was a part of WWF Superstars in the early 90s and showcased him. I decided that I wanted to write about another wrestling moment from around the same era, this time focusing on something more popular that everyone should remember. Since you’ve watched the video (right?!? ), you know that basically the Warrior comes out, gets interviewed by Bearer, gets attacked by Taker, gets locked in a casket, and then the officials have trouble getting him out. There’s a lot of psychology that happens during the skit that was fun to witness as a young fan/mark. The Warrior was a mega-face; he was the good guy that everybody loved. He had been victorious against Hogan, against Savage, and was being marketed as the next big thing…even though you couldn’t understand what he was talking about. The Undertaker, on the other hand, was being pushed as a mega-heel; not only did he do the things that bad guys did, he also appeared to be impervious to anything and was billed as being undefeatable (except that he lost to Hogan due to cheating/whining). An encounter between the two was sure to be incredible. But this appearance technically didn’t set up a Warrior/Undertaker feud…more on this later. Once the Warrior is in the casket, and Bearer/Taker lock it and mosey along, officials start coming out to try to get him out. The things they do to help including the following: trying to open the casket with their bare hands, using a crow bar and a hammer/chisel to try to pry the casket open, drilling holes in the casket to get some air in, beating the casket with a crow bar, and beating on the top and side of the casket with a sledgehammer. All they needed to do was find Bearer/Taker and get the key. That’s how someone with a brain could figure out it was planned. But, hey, most of us were 10 or 11 year old kids, so we thought he was really struggling for his life. The announcers managed to sell this better than the people who were on television. As you can probably tell, the commentators were Vince McMahon, Rowdy Roddy Piper, and Macho Man Randy Savage. Vince was technically the play-by-play guy, Piper was a face announcer, and Macho was a heel announcer. During the attempt to “save the life” of the warrior, not only do the two face announcers express their worry for the Warrior, but Macho Man, who weeks earlier had been retired by The Warrior, even is disturbed by the whole thing. He even makes a comment when the door closes that Bearer/Taker proved their point, so they should take him out and beat him up some more. If the Macho Man (who should hate The Warrior and does at the start of the segment) has pity for The Warrior, it has to be real, right? It’s the type of magic that a young kid falls for and is better for it, like Santa Claus. The ridiculous attempts to get him out get filed under the category of things that makes this a fun thing to look back on. The casket angle was the best thing Warrior was ever involved in, with the Hogan match a close second (that those two could pull off anything other than a total shitshow let alone a good match speaks to the oft understated brilliance of Pat Patterson). I remember this angle giving me chills as a kid, it was that good. And surprisingly so. I was never a big Warrior fan, to be honest, even as a kid. I never got the appeal. Things got worse when Warrior was given (for some reason) a certain level of creative control over his character and feuds, which resulted in a series of terrible and ridiculous interviews on Superstars where Papa Shango was doing magic on him and making black goo come out of his hair. And that Jake Roberts heel turn, man oh man, was that good. Too bad it was another example of personal failings wasting pure gold. Though Jake had his demons; Warrior was just an a-hole. My favorite Warrior story: he had a match with someone – I think it was DiBiase or someone that had some respect backstage – and completely sandbagged him and no-sold all his offense, completely running over him. When he got backstage, Rick Rude was waiting for him with his hands on his hips. In front of all the boys he chastised Warrior for his performance, and his response was “I don’t have to sell for anybody. I’m the Warrior.” Without saying a word, Rude punched him in the face and knocked him out cold. I never liked the Warrior either. 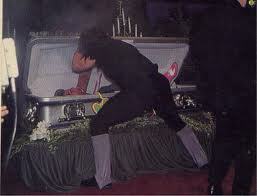 I did enjoy the casket thing, and to a certain degree, the Shango angle. Hogan also never did it for me until he dropped the leg on Macho Man and formed the nWo. I believe they tell that Rick Rude story (and other equally awesome stories that I can’t remember right now) on The Self-Destruction of The Ultimate Warrior DVD. I wish Vince would release more DVDs of what he really thought about people, because that was so biased and amazing that nothing has been able to match it.